He wants to be big and strong like his heros; too bad it’s not safe for him to start pumping iron yet! He may be a little kid, but now...voila!...there is nothing little about his muscles! 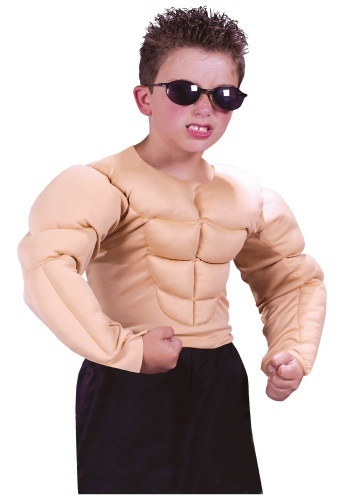 This Child Muscle Chest Shirt is perfect for a little guy’s Hulk Hogan costume or his best go at an Arnold Schwarzenegger costume. The best part? No protein shakes, sweaty gym clothes, or strained muscles required! This is a cool stuffed shirt that your little bud will love to look at in the mirror. It can be worn on its own as a costume or underneath a superhero ensemble for a more realistic look! Even if he can’t get the unlimited gym membership he wants now, this costume may inspire healthy habits in later years. And you must admit, he looks pretty darn cute flexing his “biceps” like that.